David Beckham's plans to start a new MLS franchise called Inter Miami have taken a step forward after a vote supported building a new stadium in the city. The former England captain wants to start a new team called Inter Miami but needed support from local residents for the project to proceed. In a referendum on Tuesday, 60 per cent of the votes backed his plans for a 25,000-seater stadium to be built next to the city's airport on land that is currently a golf course. 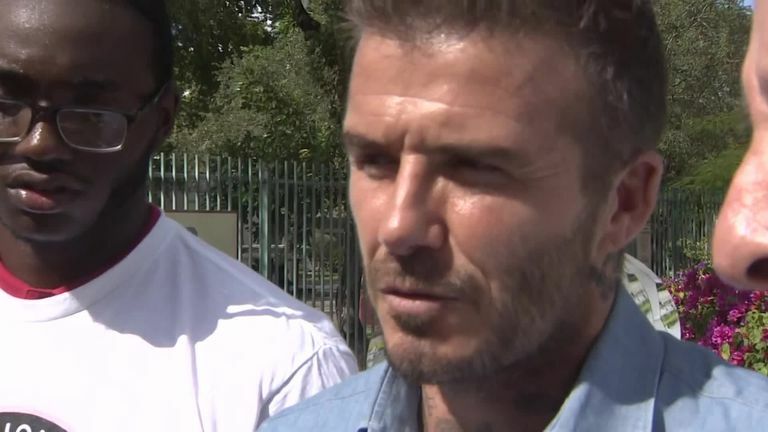 The vote is a major hurdle cleared for Beckham following five years of delays, and his team must now negotiate terms of the lease with city officials before building work can start. "I need to say a big thanks to the fans who have stuck by us," said the former Manchester United, Real Madrid and LA Galaxy star. "Today is an exciting day. We have had a dream of bringing a team to this great city. We want to create a legacy, something our children will aspire to. But we also want to win. I am not coming here just to have a pretty team. Winning championships are important to me." MLS Commissioner Don Garber tweeted his support of Beckham's plans. Beckham's group must now earn approval from four of the five city commissioners. Two of them - Manolo Reyes and Willy Gort - opposed the referendum earlier this year. Beckham's lavish $1 billion (£762m) project will include a stadium complex as well as a huge shopping mall, a 750-room hotel, office space and a 58-acre public park. Locals were encouraged to vote 'yes' to ensure jobs and other benefits for Miami including help to reinvigorate other public parks in the area.